As part of his weekly visits to institutions, this morning President Danny Faure visited both the Guy Morel Institute at Majoie and the Regional Fusion and Law Enforcement Centre for Safety and Security at Sea (REFLECS3) at Bois de Rose. At the Guy Morel Institute, President Faure was welcomed by the Executive Director of the Institute, Mrs Shella Mohideen, for a guided tour of the campus. During the tour the President had the opportunity to meet and greet the staff at their respective stations and discuss their day to day operations. Key facilities visited on campus included the Administrative Block, the IT Workshop, the Library, the Staff Room, the Assessment Office and one of the Training Rooms where a Statistics class was in progress. 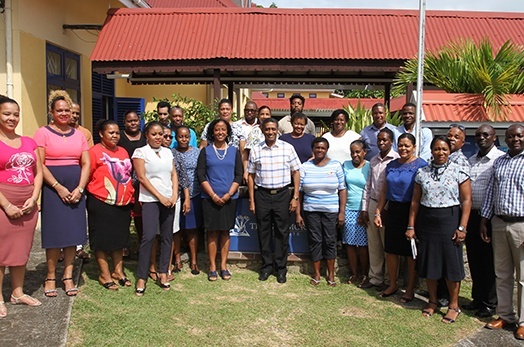 Following the tour, the President met with the management team, where they had the opportunity to brief him on various aspects such the transition of the Institute from under the purview of the University of Seychelles, redevelopments of training courses, recruitment and the way forward to transform the institute whilst harmonizing local projects and encourage greater synergy between all stakeholders including both Private and Government. The President thanked the team for the excellent work they are doing and urged them to continue to engage with government Ministries and Departments to assess their training needs and to tailor courses to better suit the Seychelles context. In line with his fundamental principles of transparency, accountability and good governance, President Faure urged management to support government in introducing a course surrounding these three core principles. From the Guy Morel Institute, the President proceeded to the REFLECS3 at Bois de Rose where he was welcomed by the Designated Minister, Mrs Macsuzy Mondon, and the Director for REFLECS3, Inspector Georges Bibi, the Director of the Regional Coordination Operation Centre (RCOC) and the Anti-Piracy Unit (APU), Colonel Georges Adeline, and the Director for National Information Sharing and Coordination Centre (NISCC), Lieutenant Colonel Leslie Benoiton. The visit began with an overview of the role of the institution through a joint presentation by the Directors, followed by a tour of the REFLECS3, RCOC, APU and NISCC where President Faure met with the staff, and saw the infrastructure and equipment in place. Following the tour, the President chaired a meeting where he expressed his satisfaction at the various systems in place he saw during his visit. He commended the high level of investments and qualified officials employed at the centre. In view of the dynamic nature of the role of the centres, the President stressed on the importance of proper coordination and communication between all relevant stakeholders to ensure the resources and technical support benefits local authorities and the country as a whole.